A tweet by John Myers, our resident cyclist has sparked the mandatory helmet law debate once again. Deputy Brisbane Mayor Adrian Schrinner went head to head with Queensland’s Road Minister Mark Bailey after our tweet lit the fire. Cr Schrinner tweeted that the Brisbane bikeshare had recorded 1.9 million trips since 2010. Nothing to crow about when compared to daily bikeshare trips in cities like New York (50,000 trips on average per day). 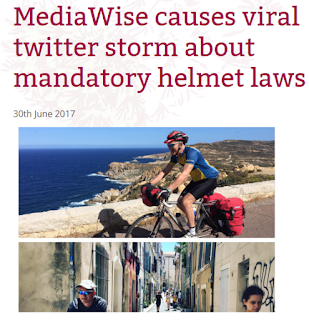 @mediawisemelb said that if helmet laws were relaxed trips would soar. “It’s not rocket science, just how the rest of the world succeeds in bikeshares”. With around 1,000 bikeshares around the world only a handful have mandatory helmet laws. No surprise to see them all failing. Cr Schrinner called on Minister Bailey to make helmets optional for Brisbane’s CityCycle scheme. Like Cr Schrinner, MediaWise would love to see a one year trial for relaxing the helmet laws for bike share in Brisbane and Melbourne where daily trips are very low. Just watch those daily rates soar! Footnote – Our bike riding Director is not against people wearing helmets, he just wants the act of riding helmet free not to be a crime. He is currently bike touring in France with a helmet and his sporty lycra on during the day but riding helmet free without lycra in towns most evenings.